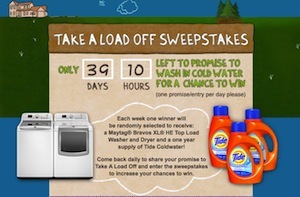 Tide and Future Friendly have launched the Take A Load Off sweepstakes to encourage cold water washing. Make the promise to switch to washing in cold water on the Future Friendly Facebook page and you'll be entered to win a High Efficiency Washer and Dryer and a one-year supply of Tide Coldwater! You can enter once per day to increase your chances of winning. A new winner will be picked each week through May 13th. Did you know that when doing laundry, heating water can account for up to 80 percent of the energy used per wash load in the U.S.? If one household switched to washing in cold for one year, they would save enough energy to watch TV for 1,363 hours! Making the switch to washing in cold is an easy change to make with Tide Coldwater, which is specially formulated to get clothes clean in cold water. Entry info: Enter once per day to increase your chances of winning. A new winner will be picked each week through May 13th. Prize: Maytag® Bravos XL® HE Top Load Washer and Dryer and a one year supply of Tide Coldwater! Take A Load Off the energy grid and the environment by washing clothes in cold water. ***Disclosure-No compensation was received. Informational post only. I am provided this information from the Take A Load Off sweepstakes via SheSpeaks.